Feast Day: Since 2016, it has been celebrated on 9 May, the day of her beatification in 1920. Louise did not know her mother and was raised by her father. From the time she was a small child, she was taken to the Dominican sisters, who gave her a good education. Later, she went on to further education at a residence for young girls in Paris. Her education was much better than that of most children her age, and Louise became one of the best educated women of her time. Louise had a desire to join a religious order, but she was not allowed to join. She married Antoine le Gras, secretary to the Queen Mother, in 1611. According to Louise, Antoine was a good man. Throughout their marriage, Louise travelled a lot and socialised with the royalty and aristocracy of France. Louise and Antoine had a son, Michael, and lived together happily for many years. Antoine, however, became sick, and he died in 1625. After her husband died, Louise met and became friends with Vincent de Paul. Despite the fact that she had come from a background of wealth, and knew many rich people, she was just as comfortable around poor people. Louise dedicated her time to helping abandoned children on the streets. She also visited sick men in the prison hospital and established a house near the hospital where, each day, many women would cook food that visitors would then take to the prisoners. 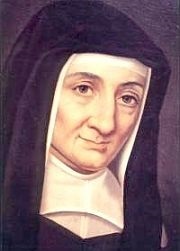 Throughout France, women set up centres to serve the poor. Louise pushed for every village to have its own clinic, school nurse and teacher. With Vincent, Louise started the Daughters of Charity in 1642. The Daughters of Charity were a revolutionary order of the poor. They helped abandoned children, people who were poor and sick, wounded soldiers, slaves, people who were mentally ill and the elderly. Today, there are over 20,000 Daughters of Charity, and they continue to help people in need. Louise is the patron saint of sick people, widows and orphans, and in 1960, Pope John XXIII proclaimed her the Patroness of Social Workers.